(FinalCall.com) - When Gulf Coast Claims Facility (GCCF) administrator Ken Feinberg took charge of the BP oil spill claims process in late August he promised to pay all documented individual emergency claims in two days and businesses in a week or less. Mr. Feinberg is now drawing mixed reactions from impacted residents and even the U.S. Justice Dept. for the slothful process that has nearly 15,000 approved claims unpaid. “I had a chance to meet with him (Feinberg) and I honestly believe he is an honorable man but I think he is realizing that he took on something that should have been thoroughly thought out. A lot of mistakes were made before him,” Byron Encalade told The Final Call. Mr. Encalade is president of the Louisiana Oysterman Association and the South Plaquemines United Fisheries Cooperative. His recovering town, Pointe A'La Hache, is a small fishing village in Plaquemines Parish with approximately 300 people, mostly Blacks. For the first time in months, he told The Final Call he sees a ray of progress among his members but says full recovery sits afar. “About fifty-percent of our members have received their claims which have helped many get back on their feet a little. Some have also been able to make money from the Vessel of Opportunity cleanup program to at least pay some bills. Things have gotten better but we don't know when we will be able to go back to healthy fishing,” said Mr. Encalade. “Some of that criticism is justifiable because of the time it's taking to review claims. I take it under advisement. I take it as constructive criticism,” said Mr. Feinberg in a recent interview with the Times-Picayune. U.S. Justice Dept. Associate Attorney General Thomas J. Perrelli expressed his displeasure with the process in a letter to Mr. Fienberg. “As the present pace is unacceptable, the GCCF needs to devote whatever additional resources—or make whatever administrative changes—are necessary in order to speed up this process,” said Mr. Perrelli in the letter dated Sept. 17. Prior to Mr. Feinberg taking over, BP paid out nearly $400 million in claims. Since then the GCCF has paid approximately 17,000 claims totalling $171 million out of the $20 billion claims fund established to compensate those directly impacted by the largest oil spill in the country's history. “The Deepwater Horizon Oil Spill has disrupted the lives of thousands upon thousands of individuals, often cutting off the income on which they depend. Many of these individuals and businesses simply do not have the resources to get by while they await processing by the GCCF,” said Mr. Perrelli in his letter. Mr. Fienberg's staff is backed up with 60,000 claims with over half still not fully processed and about 14,000 having insufficient proof. As he tours the Gulf for various town hall meetings, Mr. Fienberg is being met with harsh words from angry attendees. “Spill victims verbally attack me but it goes with the territory. You go in there expecting that you're going to receive that criticism,” said Mr. Feinberg, a lawyer from Boston. Five months after the explosion on the Deepwater Horizon oil rig in the Gulf of Mexico and a little more than a week after the well was officially “killed,” Washington-based group Public Citizen believes the work is not over. As the National Commission on the BP Deepwater Horizon Oil Spill and Offshore Drilling met in Washington, D.C. on September 28, Public Citizen energy organizer Allison Fisher urged the commission to clarify the government's role and authority during an oil spill. 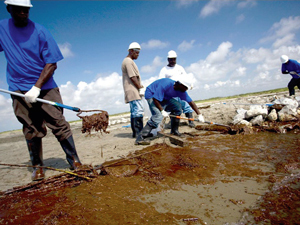 “Each day we're seeing less and less coverage of the BP oil spill. Unfortunately there are still many issues that need to be resolved. We have to keep the pressure on our government, the administration, and Congress,” said Ms. Fisher in a video statement posted on their website. Public Citizen called for a national three month BP boycott during the summer. While they are pleased by the oil well being plugged up, their work does not stop with the oil. “We need to keep the pressure on to ensure the summer of oil is followed by the autumn of reform, remediation and economic recovery,” the group says. Their top five priorities for ongoing work on the Gulf of Mexico oil disaster and energy industry influence over our political system includes the passing of comprehensive legislative response to the BP oil disaster; debarring BP from federal contracts; ensuring full compensation for BP oil spill victims; and exposing the influence of oil on government. “We really need an investigation that turns a lens on why BP was allowed to control and censor media and information around the oil spill. BP was policing public lands. They were confiscating research material and samples from independent researchers. They were not letting us see the full extent of the crisis,” said Ms. Fisher in her statement. “We still must focus on justice being served for the long-term. We don't know how long it will be before our lives are fully recovered. But the help of certain congressional officials and having stories published in papers like The Final Call and others has helped our plight tremendously,” said Mr. Encalade.